My family came from Idaho. Daddy was a construction man, so we did a lot of traveling. As we moved around the country I attended some large schools and some one-room schools. I started high school in White Plains, New York, then as a sophomore transferred to Newburgh Free Academy in Newburgh, New York. then I transferred to Salmon River High at Riggins, Idaho as a junior. When World War II started, my parents decided to move to California. Daddy eventually went into the service in Christmas of 1942. Mama went to work at North American Aviation in El Segundo, and money was tight. My older brother, Henry, was attending BYU in Provo, Utah, and we all decided that I would spend my senior year at Brigham Young High School. My parents paid for my school charges before they went to California. I lived in a dorm cubicle in Room D on the third floor of the Education Building. Those dormitory rooms in the old ballroom were just temporary panels of plywood and open at the top. From the top bunks we could talk to the girls in the next cubicles. I climbed up a nice wide indoor staircase from the main hallway to get to my "room". There were huge dinosaur bones piled at one end of the ballroom. 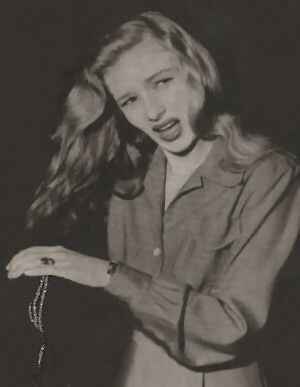 I was just sixteen when I arrived in Provo in the Fall of 1942, as a member of the BYH Class of 1943. I loved my long hair, but it was a job to do it up to look nice. I had to put it up damp at night, because it took a long time to dry. It hung half-way down my back. My boyfriends and my daddy didn't want me to cut it. At the time, I weighed only about 100 lbs. Not only was I the "baby" of the class, I was probably one of the shortest at 5'3", but my brother Henry watched over me. All of my life I had been struggling with a speech impediment -- a lisp. As a result, I was developing a tendency toward becoming an introvert, and recognized the fact. My speech teacher at BYH was Morris Clinger, and he recognized my problems. He was kind to me and quietly worked to help me overcome my insecurities. He made sure I was always involved in everything our class did. An early part of our class work involved doing a solo skit in pantomime. I came up with a skit about packing in a hurry to go home for a weekend. Living in a cubicle in Room D had taught me well how to cope in tight spaces. Our small room included two sets of bunk beds, a small dressing table and a mirror. At the end, by the door, there were two small closets. Everything else went under our beds. Just imagine four high-spirited girls in that tight space trying to get ready for classes, a game or a dance! Our speech class was held in the College Hall wing, in the auditorium on the third floor. When my turn on stage came, I knelt down and pulled a small invisible suitcase out from under my imaginary bed. I placed it on an imaginary chair. Then I opened it up and pretended to pack a few things as fast as I could. When I had packed it to my satisfaction, I closed the lid, touched up my lipstick, and slapped on my hat. I grabbed my imaginary purse and the suitcase and headed for the door -- the wings of the stage. Before I could get off the stage, however, one of my equally nervous classmates, waiting backstage for her turn to mime, accidentally broke her bead necklace. I nearly broke character and laughed when I saw her look of dismay that her beads were rolling all around my feet. Assuming a startled look, I glanced directly at my classmates in the audience, put my hand up to my throat and felt around for a second. I soundlessly gasped. 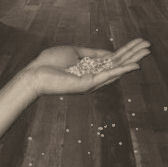 Bending down, I scooped up a handful of beads, and exited the stage clutching them along with my other imaginary items. Our classmates in the audience applauded enthusiastically. The girl with the broken necklace hurried up to me offstage to apologize, but I told her I thought the incident had actually helped my skit. Mr. Clinger commented in front of the class that he thought it was a nice quick-witted recovery. This compliment meant a lot to me. Speech classes gave me self assurance and the courage to perform for an audience. As time went by, I increasing thought of myself as quick-witted and able to cope with any unusual circumstances. Because I was so young, my college-age "roomies" got tickets to their dances and other events for me. They treated me like a kid sister, but they cautioned me not to let on that I was not a college student. Probably, they couldn't have obtained the tickets for me, if I had let the cat out of the bag. Thus I was able to go to both college events and high school activities. I was very studious and not much into dating, but I attended dances, went out for sodas, and went to church with several different boys. One day in February, however, my brother caught up with me and in a concerned voice said, "Iris, the entire campus is talking about you!" "Why is that?" I asked him, puzzled. "You don't take one brother to the college Sweetheart's Ball, and then take his younger brother to the high school Sweetheart's Ball!" he exclaimed. But that was exactly what I had done. I had met college student Hugh Law and dated him a few times. The BYU Sweetheart's Ball was girls' choice, and so I invited him. Then in mid-year his younger brother, David Law, a senior in high school, transferred to BYH. 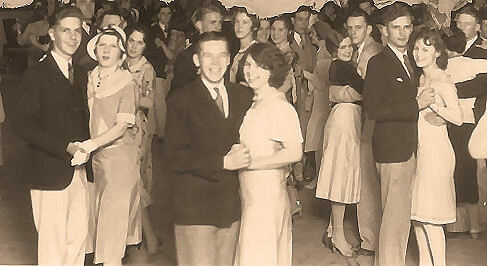 The high school dance was also girls' choice. Because I knew and liked him, I invited David and he had accepted. I enjoyed my newfound self-confidence to make my own decisions. I patted my brother on the shoulder, and assured him that everything was okay. But neither one of the Law brothers would date me again. And I had blown my cover story -- now everyone knew I was a high school student, and none of the college guys would ask me out during the rest of the school year. About six weeks before graduation, our principal, Golden Woolf, announced that some of the transfer students had not yet turned in transcripts from their other schools. I went to see him, because I had transferred from Salmon River High. My transcripts hadn't come! We decided to contact the school in Newburgh, New York where I had been before moving back to Idaho. They didn't have my records, because they had sent my records to Riggins, and now the administration at Riggins couldn't find them. You can't fake the knowledge of a subject, so they decided to give me my Junior exams the same week as my Senior exams, using tests for all the subjects I had taken in New York. I agreed to take all of the tests because there was no other choice. I passed both the Junior and Senior exams with flying colors -- with all 'A's. The only test question that tripped me up came from a college instructor who had me translate some Latin paragraphs from Cicero. He had only one more year of Latin than I did. The Latin word I didn't remember was imbibio, which means imbibe -- to drink. He had quite a laugh when I insisted that I didn't know anybody who used the English word imbibe in place of drink. Then my big brother Henry took me aside again, and said, "Iris, the entire campus is talking about you again!" "Nobody, not even a professor on this campus," he said, "has ever attempted to take two years' exams in the same week!" "Well, I had to do it, or I wouldn't be able to graduate," I said. Soon I discovered that my reputation had increased from being a quick-witted high school girl, to being a "brain". Or could it have something to do with an incident that had happened just before the mid-term exams. I had forgotten my notebook for chemistry class and went back to get it. When I came in, Dr. Loren Bryner was explaining a formula change to Will Miller, a senior, and Lorin Barlow, a junior. I listened for a few minutes, and then it was just like a light turned on inside my head. I walked toward them and said, "So that's how you get those different formulas!" They looked at me blankly. Dr. Bryner said, "You are an 'A' student and you didn't know that?" "No", I replied. "The school I transferred from didn't have chemistry last year, so I had to take physics, and I didn't start here until about Halloween, so I missed the first part of chemistry class." "Then, if you didn't understand this formula exchange, how did you get the right answers and such high grades?" he wanted to know. "Well, I copied down all the formulas you put on the board and memorized them, and I also memorized the ones in the book. How else could I keep up with the class?" They just stood there for a few moments with amazed looks on their faces, like I had done something impossible. Finally Dr. Bryner said, "What a fantastic memory!" The boys just nodded in agreement. I still can't see why they were so amazed. I simply had no other choice. Hey, it's not so bad to be considered quick-witted and a "brain" -- in fact, I loved it! During the war years, dormitory housing for students in Provo became scarce because of the influx of workers and their families to the new war industries in Utah County. 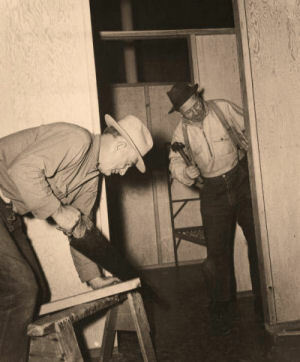 This photo from the early 1940's shows George H. Hansen, professor of geology (left), and Asael Carlyle Lambert, dean of the summer school (right), remodeling Room D (the ballroom) on the third floor of the Education Building. This effort created dorm rooms for women students, including at least one BYH coed (see story above). Other faculty and staff who helped with this temporary remodeling were Thomas L. Martin, Lynn Hayward, and Alonzo J. Morley. Her parents were Lloyd Martin Ramey, born in 1895 in Springfield, Missouri. He married Amelia Ann Burbank in 1915 in Pocatello, Idaho. Her father died in 1947 in Brasil. 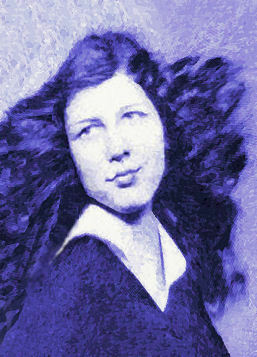 Iris' mother, Amelia Ann Burbank, was born in 1895 in Montrose, Colorado. She died on September 25, 1951 in Los Angeles. Both parents are buried in Redondo Beach, California. She says she didn't do a lot of dating, because she had the goal in mind to become a nurse. High grades were necessary for college entrance. Her children couldn't believe she often studied from 7 pm until 11 pm. Often during high school she received Honorable Mention, and sometimes appeared on the Honor Roll. Iris married Edward Lee Seyfried in 1944, and he did not encourage her to continue in nursing. Iris and Edward had nine children, and raised seven: three boys and four girls. Edward was born on February 11, 1922 in Goff, Idaho. He died on September 20, 1982. His parents were Anton Jacob Seyfried and Elizabeth Lee Soards. "Four people in my family have teaching certificates. We are staunch church members of long standing, and patriotic. "Although it was a church school, Brigham Young High School did not give any different education than the public schools did -- even the one-room schools I sometimes attended -- it was as good as I had ever seen in the public schools. "Somebody must have done something right, because I passed the Civil Service exam with 96 out of a possible 100. Iris is an active genealogist, and she has held many other Church positions in a small branch at Riggins, Idaho, and in Odgen, Utah. Her BYH Class of 1943 celebrated its 65th graduation anniversary in 2008. 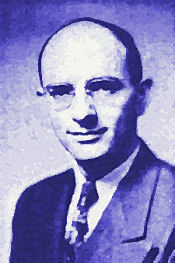 Morris M. Clinger was an Instructor in Speech, Dramatic Art, and Public Speaking at BYH from 1936 to 1946. His hobby, so he said, was speedboating. He was born on May 20, 1910 at Lake View, Utah. His parents were Martin Albert Clinger and Tenie Johnson Clinger. Morris Clinger married Louise Spafford on August 17, 1932 in Salt Lake City, Utah. He served as a speech teacher at BYH until 1946, when he moved to the upper campus to work in the BYU Speech Department. He taught at BYU until his retirement.